Amelia Gray was nine years old when she saw her first ghost. Her life hasn't been the same since. Living a rigid, sheltered life of strict rules laid down by her father when he realized she could see them as he can, Amelia spends her days restoring graveyards and sticking as close to hallowed ground as possible. Her nights are spent in hiding. Secrets have driven a wedge between her and her family; half truths and evasions the succor of her childhood. The fear instilled by the rules, by the shadows in her father's eyes, by the whispers of half-formed rumors between her mother and her aunt, keep her isolated from a humanity that sees the world through blind eyes. To cope, she guards her emotions with vigilance, restricts her expressions with iron will. And pays for such fortitude with furtive timidity. Never associate with those who are haunted. In her field, she is respected and renowned, a minor celebrity and a font of information. In her life, she is so very, very alone. Living in Charleston, Amelia has landed an esteemed project to restore a neglected but historic graveyard on the grounds of the prestigious Emerson College. Her work had barely begun before the slaughtered remains of a young girl is found half buried in an existing plot after a rainstorm disturbed the fresh soil. 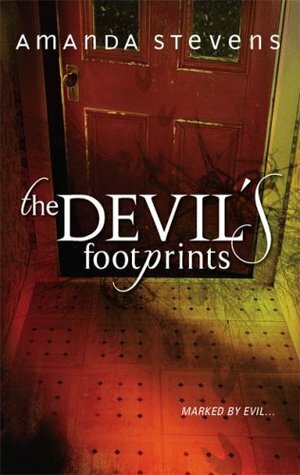 With that murder, Amelia is drawn into an investigation that pulls her out of her self-imposed isolation, but pushes her towards homicide detective John Devlin...and the two ghosts who are haunting him, slowly leaching his very essence. As more bodies are found, the horrifying scope of decades of butchery points Amelia towards cover-ups among Charleston elite, a secret sect of an illicit brotherhood, and layers of deceit and manipulation. Friends become suspect and truth elusive as a deranged killer steps out of the shadows with Amelia in his sights. This powerful, haunting series debut both amazed and impressed me with a narrative that was seeped in the scents, sounds, and sultry history of the Old South. Lyrical and flowing, the prose achieves an almost poetic, muted gloss of gentility and custom. I haven't read a book so imbued in a long, long time, a book that doesn't just tell a story with words, but evokes a sense of location that brushes along the heart and soul of everyone who considers himself/herself a southerner. There were glimpses of genius in the style and substance of the setting and moments that moved me in just the description alone. It set the tone for the story nicely, elevating it, framing it with a deep, rich southern loaminess that perfectly matched settings of historic graveyards, characters haunted by ghosts, and plots of murder and mystery. I loved the book for that alone, for the unadulterated beauty of the writing. For a series debut, there was a lot of restraint given to world building and exposition. We see glimpses of Amelia's past, enough to understand the bare minimum of her connection to family and to the ghosts she sees, but Stevens is judicious in doling out those glimpses like nuggets of gold, keeping the reader guessing and teasing them with the hope of future revelations. It allowed the focus of the plot to stick pretty close to the murder mystery as well as laid groundwork for future expansion that is both intriguing and a little terrifying (in a good, horror-loving sort of way). Amelia's narration, as this book is told in her first person perspective, didn't leave a lot of room for secondary or ancillary character development. I have to admit, I never felt like I got a clear view of the mysterious John Devlin, haunted detective and grief-stricken widower, who has his own ominous secrets but is the flame to Amelia's moth. That was a little frustrating. In fact, I just couldn't seem to relate to any of the characters, or get a feel for who they truly were. Some of that is understandable, as Amelia is such an emotional recluse in the book, so reserved and solitary, but it did create a disconnect between the characters and me as the reader. In this case I would have preferred substance over style, because I had a difficult time warming up to Amelia as a result of that disconnect, and the romantic plot threads between her and Devlin weren't as successful as I would have preferred, either. And every character Amelia interacted with (with the sole exception of coroner Regina Sparks) had moments in which their behavior seemed suspicious or off-putting, though in retrospect, that may have been intended. The plot was a little slow in the beginning, the book took awhile to get going for me, but I appreciated that Stevens maintained a logical and realistic connection between Amelia and the murder investigation that made it possible to maintain a willing suspension of disbelief. As a lover of historic cemeteries and a person who has spent hours wandering through historic graveyards gazing at headstones, I was fascinated by the wealth of information and attention to detail that Amelia had. As a reader, I was satisfied with how that information was blended with the unfolding events and evolving investigation. I did have a few issues with the final chapter or two of the book, which seemed abrupt and a little ungainly after the robustness of the story leading up to it. The resolution of the mystery and subsequent events sneaked up on me and took me a bit by surprise with their haste and brevity. It seemed just as the perpetrator of such heinous crimes is revealed, it's all over but the stitches, and I was left with a mild feeling of confused dissatisfaction towards the mystery plot line that not even the epilogue could quite dispel. There were several secondary plot threads left dangling at the end of this book (including the romance), and while those didn't contribute to the dissatisfaction I mentioned, as I prefer a series debut that has tasty teasers and hints about future series direction, it does leave me anxious to find out when the second in the series is slated for release. 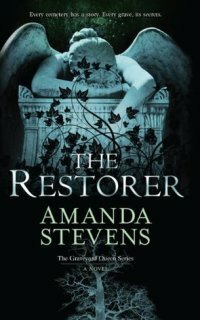 Though the primary murder mystery was solved, The Restorer is much like an iceberg in that ninety percent of the story that was started here is still mostly untold or lacking a full resolution. The book lover in me who craves reading intelligent, lyrical, intense and atmospheric series and seeing the genuine evolution of characters who grow into familiar friends over time is thrilled by the glimpse of such tremendous story potential in the series, but the impatient (and sometimes, I admit, petulant) id that so stresses out my superego wants to know how long she's got to wait. And she has a tendency to pout. Hey, I don't see ghosts, but I never said I was sane, either. I have to admit I really enjoyed this book. Mostly I enjoyed a paranormal mystery/romance book in which the protagonist acts as a mature adult. I've read too many stories in the past where the main character had all the emotional maturity of a 12-year old. Amelia Gray is a cemetery restorer who is able to see ghosts. But these are not the "Hey, how ya doing?" kind of ghosts. These are creepy, chilling, parasitic kind of ghosts. Hi, Canada. Thanks for stopping by! You're spot-on with the description of the ghosts in this book. They're not exactly of the Casper variety.